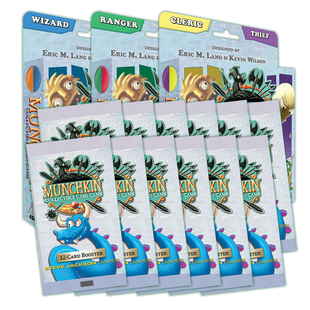 Daily Illuminator: Munchkin Collectible Card Game Starters Back In The Warehouse! May 26, 2018: Munchkin Collectible Card Game Starters Back In The Warehouse! When we launched the Munchkin Collectible Card Game earlier this year, we were painfully short on the game's three Starter Sets, leaving some of our larger distributors without any games for retailers. While the game's starters never quite reached "impossible to find" status over the last quarter, there were more friendly local game stores without access to the starters than we were expecting. Fortunately, we can now report that the reprint of all three sets has arrived and we've started shipping the games to our distributors. There is one significant difference between this latest wave and the game's first printing. As we mentioned back in February, the first-printing starters included a bonus Munchkin Collectible Card Game booster pack. This latest printing, however, does not include that bonus. Those of you who can find the first printing – look for the seal on the front of the box stating there's a booster inside – will want to buy one to take advantage of the extra value that we packed into the first run. The starters are back in the warehouse just in time for the release of the game's first expansion, The Desolation of Blarg, which is set to reach stores later this month. You can get a look at the upcoming expansion in this Facebook Live video, where Rhea pops open a few packs and shows off some of the expansion cards.